More than 100 million KED tokens up for grabs simply by verifying yourself on the exchange. MELBOURNE, VICTORIA, AUSTRALIA, April 17, 2019 /EINPresswire.com/ -- Nauticus Exchange will airdrop up to $2.3 million worth of KryptEd tokens to verified users of the platform. More than 100 million KED tokens are up for grabs. The standard claim will be around A$50 worth, or approximately 2200 KED tokens — and each account is eligible for one claim. There are only a limited number of claims available in the first round so you’ll need to get in quick. 1. Sign up for an account and verify yourself on Nauticus Exchange. The process only takes around 5 minutes. 2. Head to the claim form, and submit. 3. NOTE: Airdrop claims are collated each Monday before being verified against our records. This process can take up to seven days (from each Monday) before the KED is credited to your account. KryptEd is an innovative Ethereum-based crypto education platform that aims to gamify the study of blockchain technology and cryptocurrency trading by rewarding students with KED. By 2020, it aims to be a fully Decentralized Autonomous Organization (DAO) blending aspects of Earn and Steemit with Udemy and Coursera. 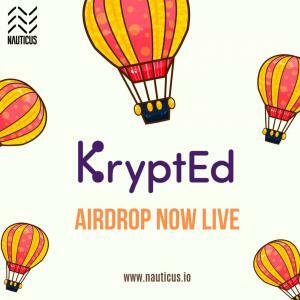 KryptEd is scheduled for listing on Nauticus Exchange which means participants of the airdrop will be able to trade their KED tokens on Nauticus in the future. KED is also scheduled to list on the Turkish based crypto exchanges Ovis and Bitfeks. The KED airdrop is just the beginning, with Nauticus Exchange planning to roll out a series of digital asset airdrops to both spread the word about worthy projects and to reward users of the exchange. The KED airdrop has already begun and ends on May 15. So you better get in quick! Nauticus Exchange is Australia's fastest growing digital currency platform. With 282,000 registered accounts in 84 countries, Nauticus is well on its way to becoming Australia's first globally digital financial platform. The AUSTRAC regualted platform launched in the fourth quarter of 2018 and offers trading in Bitcoin (BTC), Nauticus Coin (NTS), Ripple (XRP), Ethereum (ETH), Eos (EOS), Bitcoin Cash (BCH), Litecoin (LTC), Dash (DASH), Ethereum Classic (ETC), Zcash (ZEC), True USD (TUSD), OmiseGo (OMG), Mithril (MITH), Basic Attention Token (BAT), Aelf (ELF), Status (SNT), Maker (MKR) and Baer Chain (BRC). Nauticus is rapidly adding currencies on its way to 100 digital currencies and six fiat by the end of 2019. Nauticus has the lowest fees of any Australian exchange of just 0.1% - and NTS holders can access a further discount that brings the fee down to a tiny 0.05%. The platform offers advanced functionality, but also includes an Easy Trading Wizard, to help newcomers to crypto make their first trades. It simply asks users which cryptocurrency they want to buy, how much of it they want, and which currency they want to pay for it with. Nauticus has also introduced a referral system, where you and a friend both earn $25 worth of NTS simply for signing up and completing verification.